Thor: The Dark World is a big movie. It has a big cast of big actors. It has big action and big set pieces. It has a big story of galactic proportions. And it doesn't make a lick of sense. At least not to this lay reviewer. There are nine realms that need taming, a blood feud of unclear origins and a intergalactic convergence of some sort. It's safe to say Marvel acolytes will get more mileage out of the film's complex mythology than Jane Moviegoer. Thor (Chris Hemsworth) has returned to his homeworld of Asgard after the events of The Avengers, and as the film begins, he is on a mission to tame marauders in the Nine Realms (uh... I guess that means bad guys on other planets needed to be fought and Thor is the one to do it). Unfortunately, as a prologue tells the audience, the long forgotten race of Dark Elves have returned to reclaim the Aether, an evil energy source. Their return is timed perfectly with the "convergence" of the Nine Realms, basically an alignment of all the worlds in the Thor universe. The convergence apparently amplifies the ability of the Aether, and will allow the Elves to destroy the everything and everyone. Or something... Thor's human love interest Dr. Jane Foster (Natalie Portman) is still up to dubious scientific research, along with her technobabble spouting compatriots Darcy (Kat Dennings) and Dr. Selvig (Stellan Skarsgård). When Thor learns that Jane has discovered a convergence portal, he returns to Earth as the team uncovers - and attempts to stop - the plot by the Dark Elves. Thor's brother Loki (Tom Hiddleston) is in the mix as well, ever up to his tricks. In the first film, Thor was a fish out of water on Earth, and there was a lot of room for slapstick and comic relief. There was a certain sense that film didn't take itself too seriously. While slapstick elements are present in Thor: The Dark World, the main plot is deadly serious and the backstory is incredibly dense. In fact, it may be one of the most violent of the recent Marvel Comics films in terms of sheer body count. The production and costume designs are fantastic, on par with the best anything Star Wars or any other big budget franchise has to offer. The cosmic imagery, of questionable scientific basis, is inspired by the work of comic book artist Jack Kirby, and it looks wonderful on the big screen. From the kursed alien design, to spaceships, to galactic vistas, Thor simply looks great. 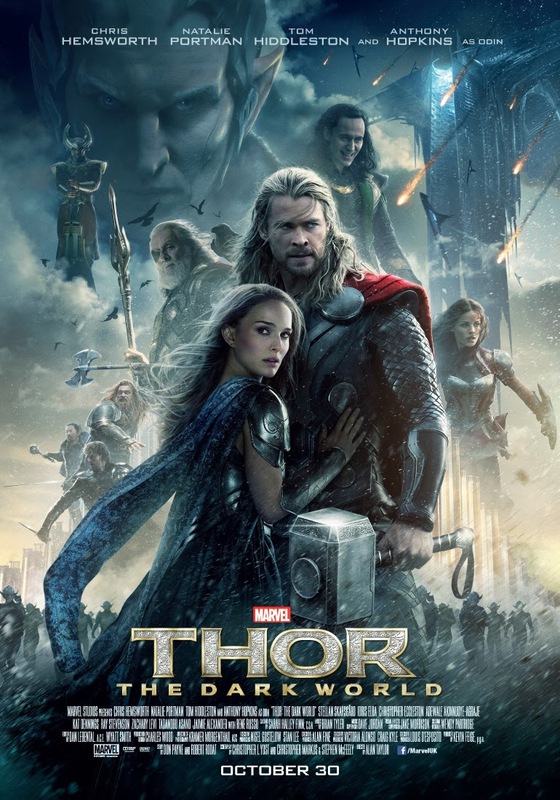 Thor: The Dark World was helmed by veteran TV director Alan Taylor based on a screenplay by Christopher Yost, Christopher Markus and Stephen McFeely. Anthony Hopkins (The Rite), Idris Elba (Prometheus), Rene Russo and Christopher Eccleston (28 Days Later...) also star.